As often is the case with many - or maybe it is just me - reflection, contemplation or just plain old daydreaming features largely in my everyday life and has been so since I was little. As anyone who has been pestered by my endless questioning that usually includes the word ‘Why?’ can agree? In fact one of my favourite books, I received as a child, was the Hamlyn book of why …or was how? , whichever? Why is probably quite an annoying word to my close family! In the midst of their important activity I interrupt them with ….why does this work like that? Why does this have to happen? Why did you do that? Why do they do that? ‘What?’ Is another favourite; what are you thinking about right now? As I can never accept that an individual can actually sit and think of nothing. I seem never to be. They, my family, all answer most of the time with measured patience. 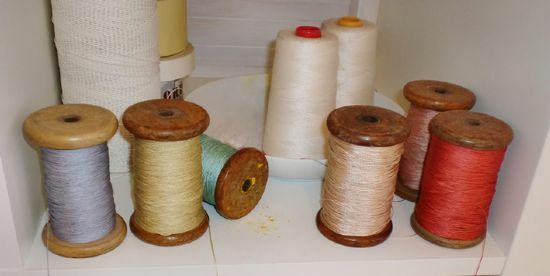 When out the corner of my eye I hear (I know that doesn’t make sense but it was a joint definite hearing and seeing moment) I see/ hear a bee flying down into the top of reel of yarn sitting on my shelf of my studio opposite me. It wasn’t any old reel of yarn but an old wooden one of colour silk. I bought various colours of this silk yarn at the shop connected to textile designer friend in Orkney quite a few years ago (Orkney being a very special group of small island in the far north of Scotland where very special family friends live and work). Well you never know when you might need some silk yarn??? Having spent my formative art school years studying textiles: weave design on large scale dobby looms was part of course, with dreams of future employers such as Sacho Hesslein and other such fine fabric design houses or follow in the footsheps of the great weave master Jack Lenor Larsen. All those who have been through this study and learn to love intense repetitiveness, would find it hard to resist beautifully coloured silk yarn on a equally nostalgic wooden reel, each of us would choose a different texture, colour or yarn type but the feeling of the of sitting at large wooden dobby loom would no doubt be relived. I have no idea if my new visitor to the studio has the same feeling but as I lift the said reel I notice a small yellow patch of dust. I think in tandem pollen and pigment. The previous day I was mixing a beautiful (again my personal preference) blue pigment with some gesso in a terracotta container once home to sheep’s yogurt. Then to brush and smear it, in a not so traditional way, onto a roll of paper original meant for digital printing (another story). I had watched a programme through the wonders of YouTube of a journey to hunt down the pigment used and mixed to create a specific painting by the great artist Titian. The incredible efforts were shown of those great masters; in reality the people of Afghanistan who went to mine the precious Lapis Lazuli rock. It was then shipped or carried to the land of the pigment makers where it was ground by hand to the point of powder, sieved, mixed with resin, kneaded in water, strained, gathered up and sold to the artist whose assistants would mix it with walnut oil, or another depending on the finished colour. 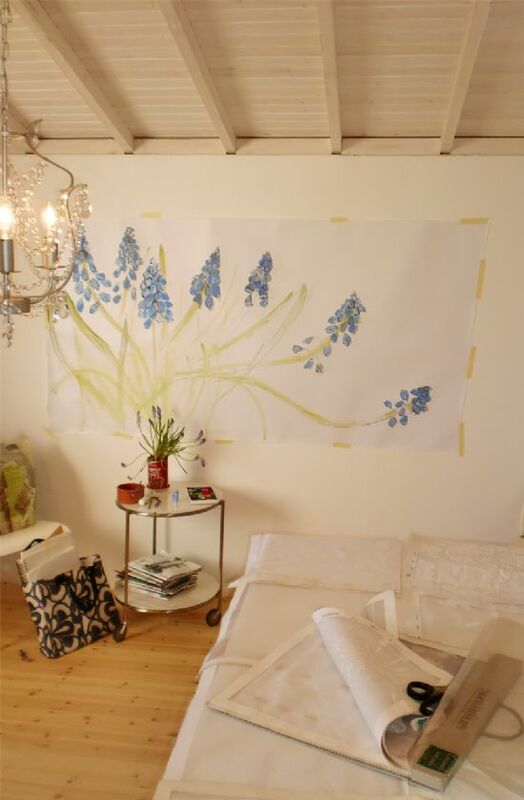 The artist then carefully placed it on an equally specially prepared canvas. The painter and painting could then begin. I am reminded of this as I scooped a bit of blue pigment from a plastic pot, bought in a shop probably meant for purchase by an icon painter, as I mix it with gesso (the traditional base coat of many traditional painting surfaces). I apply my pigment/gesso mixture to my large piece of unusual textured paper with a brush and smudge it with my finger (don’t sniff – pastels benefit from said fingers too). I have to add; I do this with equal thought, care and precision of, I imagine, my great predecessor – the materials may vary but I wonder how different our thought process is: only he and I will know. I digress with my usual wonder and questioning. I hear a buzz, a definite zzzzz sound, as I lift the reel a little powder of yellow drops out and I wonder what to do. I look under my buzzing reel of yarn to see that the hole in centre has been filled with a yellow substance …. I take the new home and its inhabitant to my shed door and tap to try and encourage my little friend out who zzzzz’s a lot more and won’t leave. Too busy enjoying his new found safe home full of creativeness, I leave them both to rest on the door ledge and go for a second opinion. The sample books of sheer fabric that have sat in the corner of the studio are now in the process of being patch-worked together into an mossie net of fine design (Sacho Hesslein no less again, another story). The little bee, whose inquisitive wonder had brought it to stay in my studio with its potential of enthusiastic annoyance to future creatives, will be redirected…(not yet however, he is still busily flying back and fore with wonderful anticipation). The sheer curtain will hang at the door to encourage my busy creative visitor to take its precious pigment and to a go to another home that will be equally safe and where its wonderful industry will flourish to provide nourishment and wonder to others…and… I can get on with my drawing. 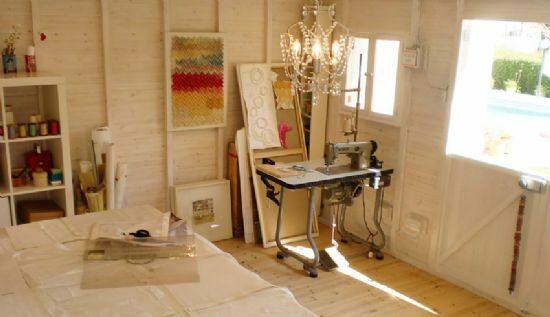 The shed with the chandelier… a place where, from small beginnings, with gentle but strong encouragement, the why’s, what’s and how’s will be heard and developed into ideas, moving on to find their intended home,be enjoyed or even change minds. Comment from (Mr.) Kelly Stewart at 18:17 on 02 April 2011. Love your shed!! Beautiful space to work!! Comment from Tracy at 14:21 on 04 April 2011.